Twenty one Forsythe students looking for an extra challenge got just that as members of the school’s first Robotics Club this fall. The club is co-coached by Forsythe teachers Ami Snapke and Mikell Eiler and Snapke said she is looking forward to the club’s second year. It includes students in all middle school grades. Snapke said she was approached by Skyline High School’s Robotics Club coach David Coupland, who suggested she start the club. She had a table at fall school registration and signed up the school’s first team. Forsythe Middle School teacher and robotics club coach Ami Snapke works with two club members who are researching their topic for next fall. The $700 cost of the club – including purchasing robots – came from the school’s PTSO and a General Motors Corporation grant. The club participated in its first competition on Nov. 20 in Monroe, with a focus on the topic of “biomedical engineering.” As part of the competition, they moved red blood cells as one of their missions. They also researched the topics of color blindness and lung cancer and created presentations about them. Viking Bots team No. 9452 won an award for “Gracious Professionalism” at the competition and team No. 2257 placed fifth place for highest points earned in robot-to-robot competition at the table. Mentors from the Skyline Robotics Club were on hand to assist. Although the students might be good on either the robotics side or the research side, Snapke said she tries to mix it up. “I try to get everyone to do everything – get out of their comfort zone,” she said. The club will meet only over first semester; teams research their topic, do create presentations about the topics and then program Mindstorms NXT robots to complete missions related to the topics before going to competition. Next fall’s topic will be “food contamination,” which some of the members have already started researching to get a head start. Club members Jacob and Nima, both 11, were working on their research during recent visit to the after-school club. They said in the next competition, they planned to use PowerPoint or Keynote to give their presentation more special effects. “I think robots are pretty cool,” said Jacob. Nima said he had worked with the Lego Mindstorms robots before joining the club this year. 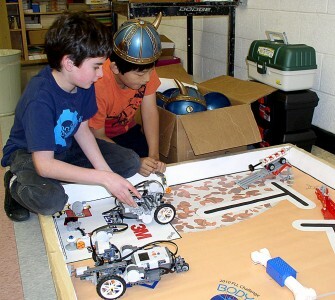 Members of the new Forsythe Robotics Club show how they compete. Snapke said her goal is to have next year’s Robotics Club in place by the end of the year so they can begin quickly when school starts. Also next year, she is hoping some of her eighth-grade members will come back and mentor younger club members. She also plans to do some community outreach to bring in real-life speakers about their topics, such as food industry experts. Any community members interested in becoming part of the Forsythe Robotics Club experience by being an expert speaker or who wish to donate toward expenses for next year’s club may contact Snapke via e-mail at snapkea@aaps.k12.mi.us.